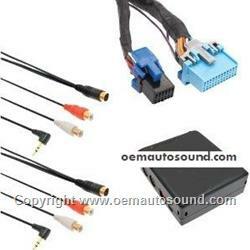 Audio Input interface, converts your Chevrolet Cobalt Malibu XM port into an auxiliary audio input, simple plug and play comes with all the GM plugs allows you to input audio from any Mp3, iPod/iPhone, or any portable audio source. This interfaces are not tape adapters FM transmitters or FM modulator, there is nothing wireless about them, which means the signal isn't getting degraded by the process of sending it to your car radio. The good thing about an auxiliary Interface is that it is a digital direct connection of the audio signal from your Mp3 portable satellite radio, smart phone iPod/iPhone to the Oem car stereo this way you will get the best sound quality. Two separate inputs, RCA jacks and 3.5mm mini jack. Retains factory-installed satellite radio, if vehicle is Satellite radio ready. Radio must have "Band" Cat or "XM" button to be compatible. Integrates two auxiliary audio sources directly to the Cobalt Malibu factory radio. 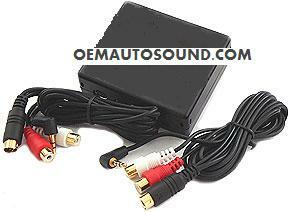 Ideal for Mp3 players, portable DVD players, handheld GPS, laptops and gaming system.